With all the fall excitement in the air I couldn’t help but start thinking about the scent of spices, scrumptious squash soups, and fresh crisp apples just begging to be put in a tart. For most people, it’s far too early to be worrying about what you are making for Thanksgiving. However, when you have a food blog that is coming up into the busiest season for eating, drinking, and being merry, one must be prepared! I have been dreaming up the perfect apple dessert that is worthy of even the most show-stopping Thanksgiving table. This recipe has been unfolding in my daydreams for a couple of weeks now ready to be birthed into a delectable French tart. 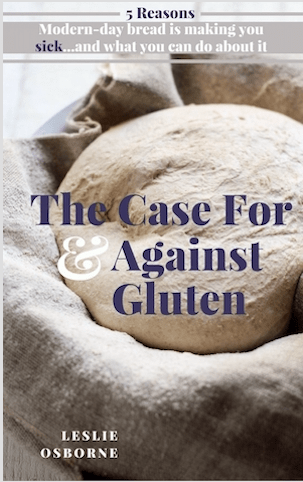 I woke up this morning determined to give this recipe a shot, hoping that I wouldn’t have to go through several attempts before I hit the nail on the head. I’ve made plenty of tarts and pies in my day to feel pretty comfortable with the challenge of a one-and-done recipe. My first (and most important) objective was to inject plenty of Bourbon into a traditional French apple tart. I also wanted a buttery, flaky pastry dough, and a brown sugar crumble. As a secret ingredient, I wanted to add apple butter to the glaze to give even more concentrated apple flavor (I just might have to trademark this secret that is not-so-secret anymore). When I asked my husband what kind of bourbon he suggested (he’s the fine liquor connoisseur of the house), he recommended Knob Creek, which is a specialty bourbon made by Jim Beam. This is not an affiliate link, therefore I paid for this Bourbon out of my own pocket and I am not being paid for this post! 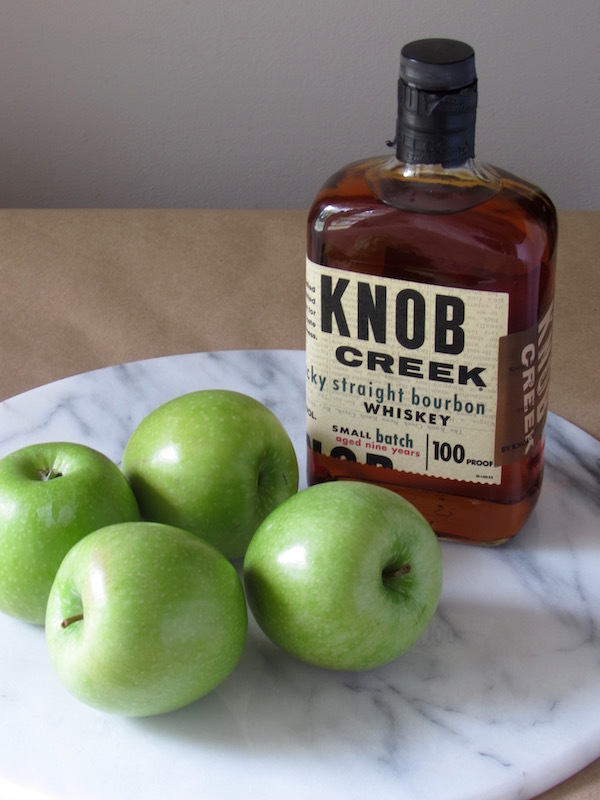 Of course, any bourbon that you have or like to drink will work great in this recipe. Now that we have the bourbon covered, let’s get baking!! Start by mixing the dough because you want it to have time to rest in the fridge for at least thirty minutes before rolling it out. Feel free to make this a day ahead and place in the fridge overnight, or better yet, make it up to a month in advance and freeze! First, cut really cold butter into small chunks. Once they have been cut into chunks, put them in the freezer for about ten minutes to keep them cold. 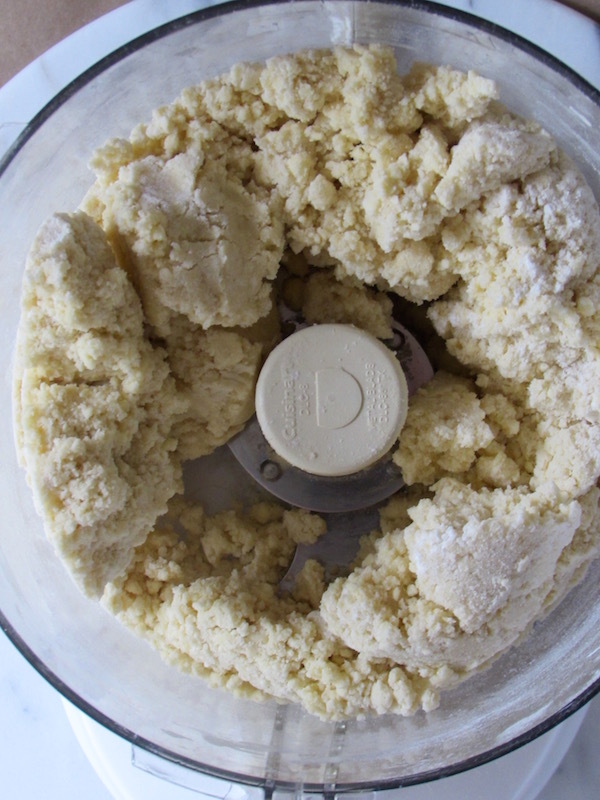 The easiest way to make a pastry dough is in a food processor. It just takes a few pulses to incorporate the ingredients…done! However, a pastry cutter or your fingers can be used to incorporate the ingredients in a snap. Flour, butter, cold water, cold vodka, and salt is all you need. Let the dough rest in the freezer for thirty minutes or in the fridge for an hour prior to rolling out. 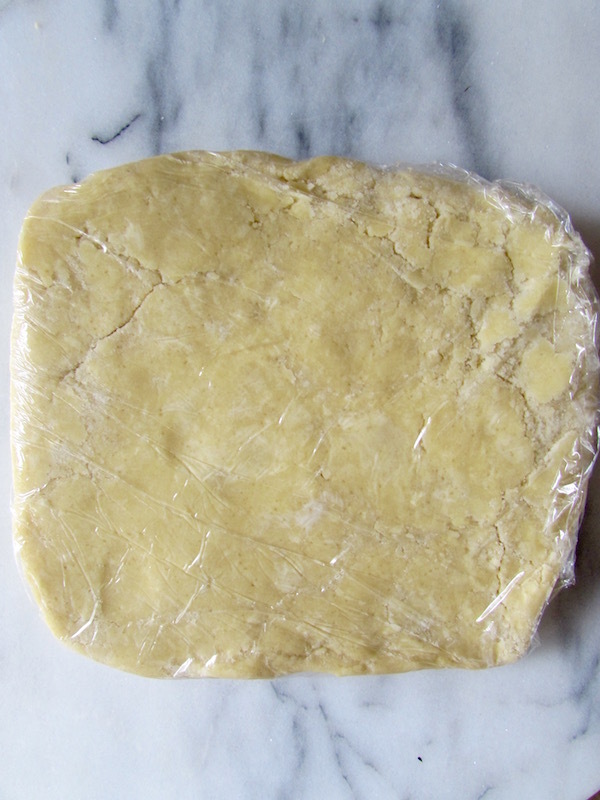 Roll out the dough between sheets of plastic to help keep it together and invert in a buttered tart pan. Puncture small holes with a fork to allow for steam to escape. Peel, core and slice the apples about 1/4-inch thick. 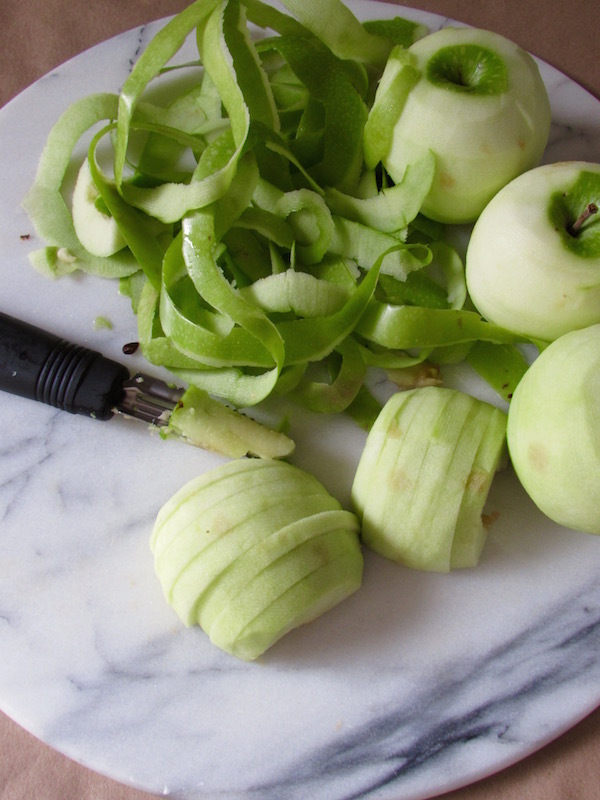 Squeeze a bit of lemon juice over the sliced apples to keep them from browning. 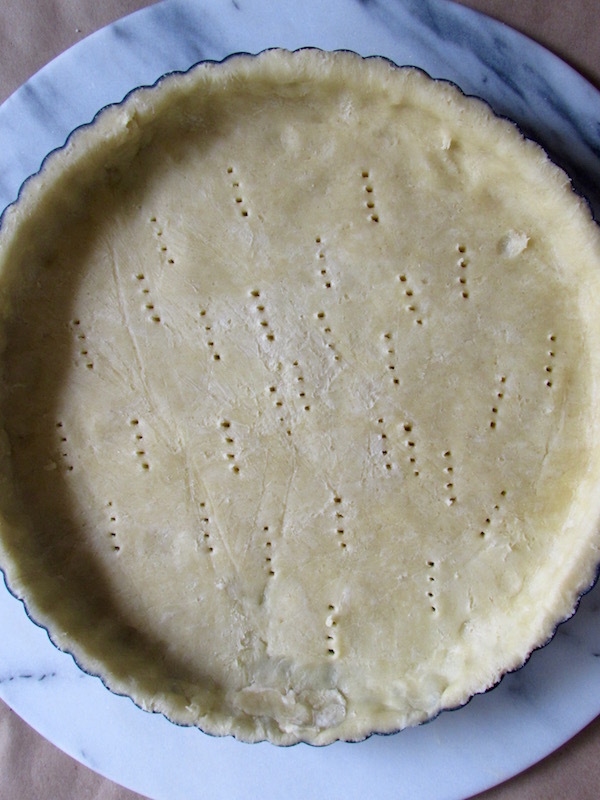 Fan them out in the tart pan by overlapping in a circular pattern. Meanwhile make the glaze in a saucepan by melting brown sugar and butter together. Add the bourbon, vanilla, apple butter, and baking powder and simmer until thickened slightly, one to two minutes. 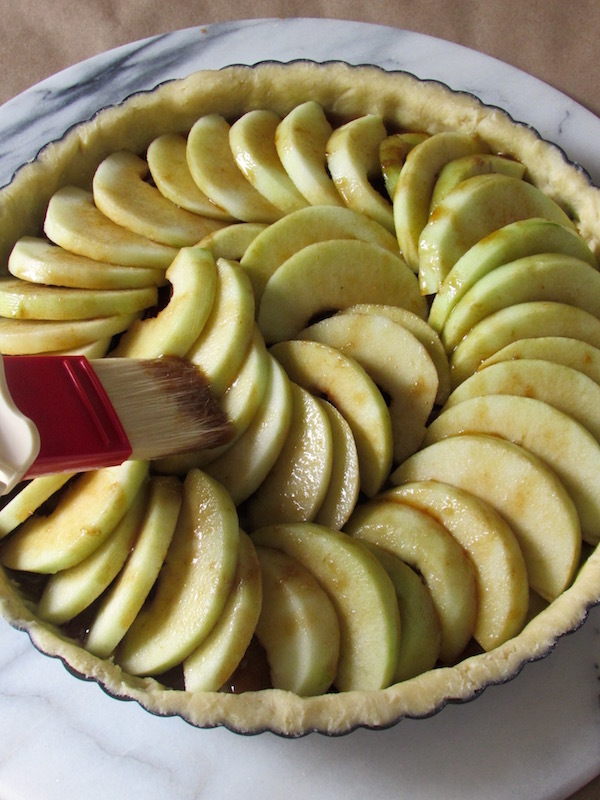 Pour the glaze over the apples and brush with a pastry brush to evenly coat. Now make the crumble by mixing melted butter, more of that beautiful brown sugar, oats, and all purpose flour. Top the tart with the crumble and bake for about 40-50 minutes or until crumble and crust are golden brown. Just look at that beauty!!!!!!! This post contains affiliate links for amazon.com which means I receive a small commission for purchases made through the links. I only recommend products I use and love. Thank you for supporting Bessie Bakes! 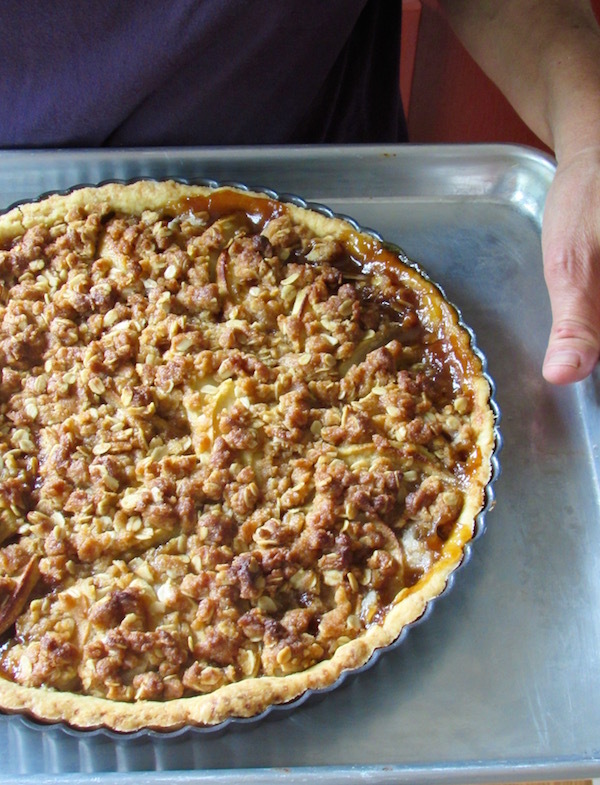 A delicate French apple tart is enhanced with the deep caramel flavors of bourbon, brown sugar, apple butter, and topped with a brown sugar crumble. Cut cold butter into small chunks and place in the freezer for ten minutes. Mix the water and vodka together and place in the freezer too. Pulse the 2 cups of flour, sugar, and salt until combined. Add the cold butter and pulse until they are broken into tiny chunks. Pulse in the water and vodka mixture until the dough just starts to come together. Cover with plastic wrap and place in the freezer for 30 minutes or in the fridge for one hour. The dough can be made up to one month in advance and frozen, or up to three days in advance when stored in the fridge. While the dough is resting, peel, core, and slice the apples. Drizzle a little lemon juice on top to keep from browning and cover with plastic wrap. Roll out the dough between sheets of plastic wrap to help keep the dough intact and invert on a buttered tart pan and gently press into the bottom and sides. Remove the excess dough around the edges and puncture wholes on the bottom of the shell with a fork to allow steam to escape. Overlap apple slices in a circular pattern in the shell. Heat a small saucepan over medium heat and melt the butter and brown sugar. Add the apple butter, bourbon, vanilla, and baking powder and simmer until thickened slightly, about two minutes. Pour the glaze over the apples and spread evenly with a pastry brush. For the crumble, melt the remaining butter 6 Tbsp. butter. Combine the butter, flour, brown sugar, and oats together. Distribute the crumble over the tart. It will not cover it completely. That is ok, we want the steam to escape. Bake for 40-50 minutes or until the crust and crumble are golden brown. Let cool at least 30 minutes before serving. Serve with unsweetened whipped cream. Oh my, this tart looks wonderful. I am trying to practice girth control but this will have to be tried. Nice post. This will be absolutely perfect for our Thanksgiving Dessert. Beautiful and delicious sounding. Thank you for sharing. 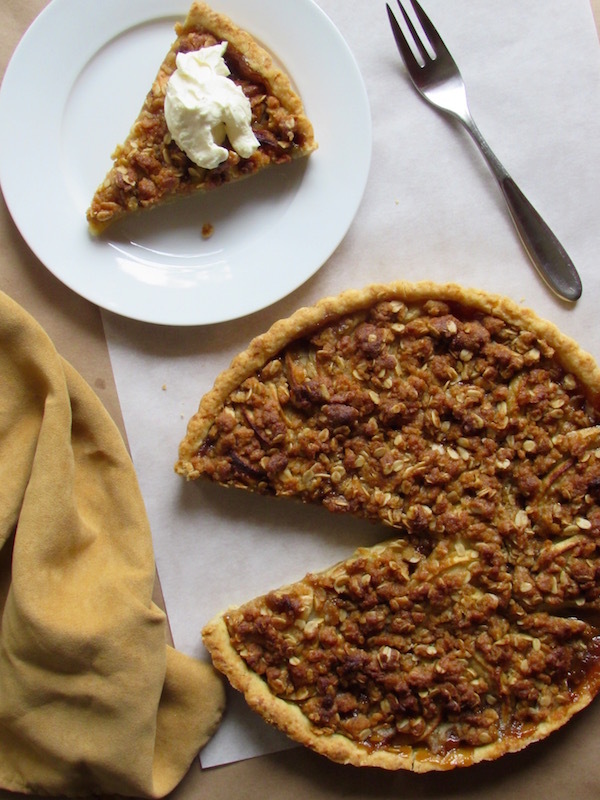 I am not a bourbon person except when its used in dessert..this tart looks fantastic. This looks so very delicious. I love this time of year! Any recipe of Bourbon is a friend of mine. …I think that’s how it goes, right? Bourbon in dessert tastes fantastic and I’m literally drooling ….Love your recipe. That crust looks spot on! What a fabulous combo of fall flavors. Looks SO good! This beauty is yummed and pinned. I want to make this. It looks just fabulous! Oh what a beautiful tart. In the UK we nearly always use Bramleys for cooking, but I think that they really are not at all common overseas? I’m not familiar with Bramleys but that doesn’t mean much. I don’t do the liquor buying myself, but I sure do love to cook with it! 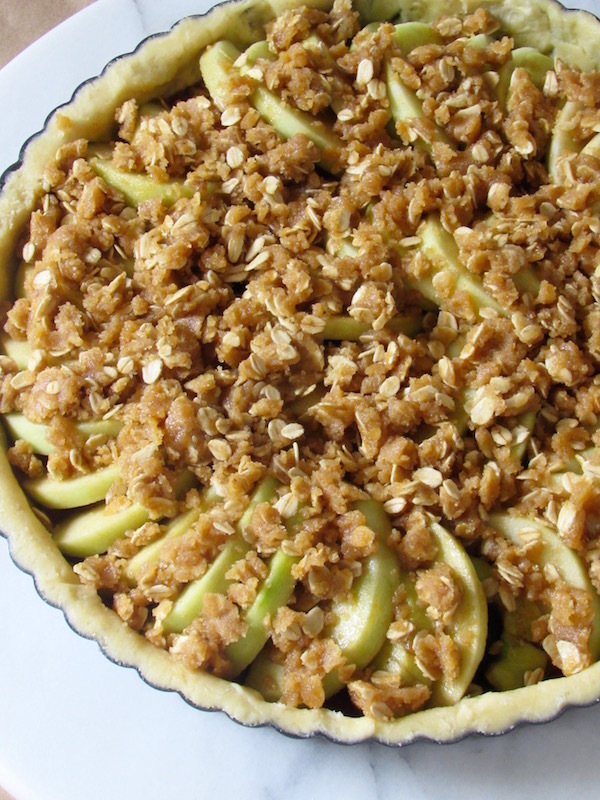 This is such a beautiful tart and sounds delicious with the apple butter and brown sugar crumble, yum! This is a perfect Holiday dessert. Looks absolutely beautiful. Beautiful tart, wish I had a slice now!! Oh my! Bourbon, apples AND a crumble topping? This is the most perfect dessert… ever!!! This recipe sounds delicious but I believe tog forgot to include how much butter goes in the crust. You only listed the flour, sugar, salt, vodka and water.